This is a really great white wine. Im impressed! any idea where we can get the caloric value of this wine? Sorry simmybb. We are not certain where to find the answer to your question. A Google search as well as a trip to the grocery store ended with no answers... would defer to our Readers if they have the answer or can suggest where to find it. According to the Cavit website (whodathunkit eh?) 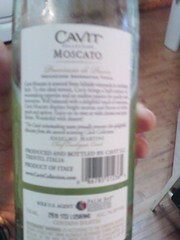 a 5 ounce serving of their Moscato has 127 calories. But really - all wines are pretty much the same number of calories per serving. I'd bet there is not much more than a 10-15% difference between any variety. So unless you are also measuring each serving with a graduated beaker so each serving is precisely measured I would just assume any glass of wine is in the 115 calorie area. Love this. 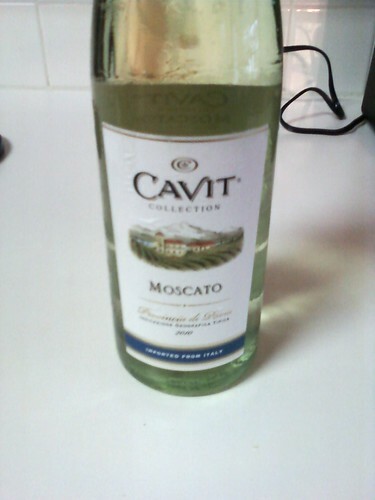 I found it to be less sweet than some Moscatos.